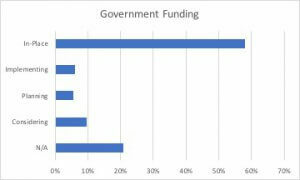 58% of respondents indicated that they currently receive some form of government funding. If the N/A responses are excluded, the rate is 73%. This was higher than expected and added urgency to our efforts as the Foundation anticipates the likelihood of cuts in government spending in the areas of focus for nonprofits. Still, there are good opportunities for the 10% considering, the 5% planning, and the 6% implementing government funding sources. In conversations, the Foundation heard many stories of organizations that had become dependent upon government funding who then suffered due to cuts, delays, or process issues. Clearly it is an area with large potential, but also many pitfalls. It is an area where there is a substantial need for coordinated education and support. 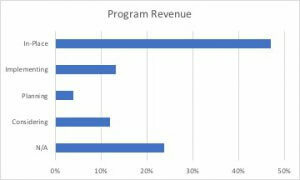 Program Revenue was, not surprisingly, a source of funding for 47% of respondents, with 13% implementing, 4% planning, and 12% considering seeking Program Revenue.Â 24% considered it N/A. This is an area for further education and work as there is an opportunity for refined business models to balance Program Revenue with sensitivities to constituent situations, including the possibility of locating third party funders to augment existing revenue streams. Volunteer Development showed the most balanced response rates with 37% in-place, 17% implementing, 12% planning, 16% considering, and only 17% N/A.Â The Foundation has discussed this model and has been impressed with the success of organizations such as Habitat for Humanity. With Habitat, their model is well developed with volunteers engaging in the construction of homes under the supervision of licensed and experienced builders and carpenters. Volunteer participation results include more than the completed construction. Volunteers who have spent an afternoon hammering nails, painting walls or laying carpet leave with a sense of pride, accomplishment and inclusion in helping to build their community. Perhaps most important is that sense of inclusion. 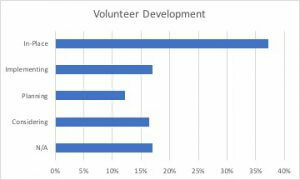 As a result, their volunteers are far more inclined to make meaningful and continued financial contributions. Most organizations have volunteers, but most also admit that volunteers often require more time and effort to manage than it would take to perform the work using paid staff. The keys to a successful effort involve coordination, communication, planning, and continued consideration of how volunteers fit into a mission, program delivery model, and all aspects of logistics. This is an area where the Foundation expects to find substantial benefits from workshops and cohorts focusing on teamwork to enhance volunteer development. 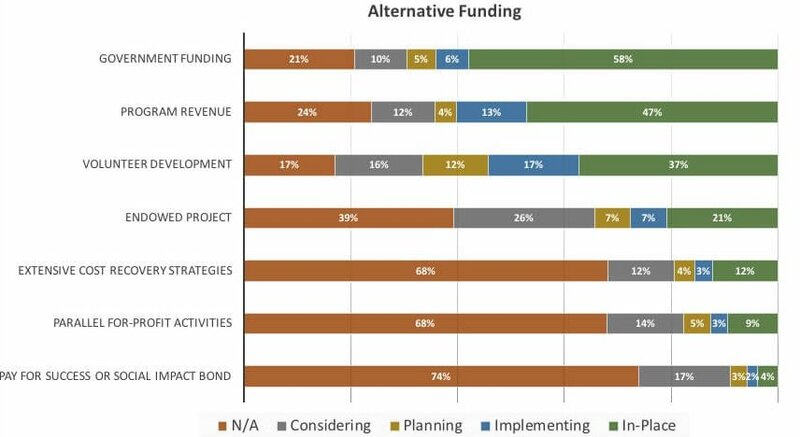 Traditional development efforts were not part of the survey as it was assumed that 100% of those surveyed are engaged in soliciting funding requests from individuals, corporations or foundations. 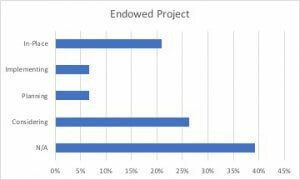 Itâ€™s a well-founded assumption as the data for the list of survey recipients was derived from the email addresses associated with grant requests from the Beveridge Family Foundation, Inc.
Only 21% of respondents indicated they have endowed projects in place. Of the 26% considering, the 7% planning and the 7% implementing such efforts, conversations showed that many nonprofits aspire to build endowments but lack the experience to succeed. This area will be the first explored in-depth with a workshop in September of 2018 hosted by a firm with proven success in working with nonprofits to build endowment funding. Most nonprofits are already engaged in traditional development efforts and would likely be comfortable in simply expanding current efforts. 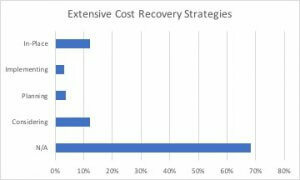 The differences between the mindset of the nonprofit and business communities was apparent by the responses to the question regarding extensive cost recovery strategies. This is an area of constant attention in the for-profit world, but in the nonprofit world there is distaste for this approach since 68% consider it non-applicable. The Foundation sees opportunities for discussion and creative exploration into finding areas of savings through expense reduction or sharing of excess capacity. In conversations leading up to and following the survey, many admitted that prior attempts at cost cutting resulted in demoralized staff, increased costs and reduced levels of service. In many instances, cost cutting measures were taken under duress and external pressure rather than with informed and active participation by organizational staff with clearly defined goals. If the goal of cost cutting is to provide better, rather than marginalized, service by more accurately and acutely deploying scarce resources, there may still be opportunities for success in this area and the Foundation will focus on highlighting and sharing those successes. The next question concerned parallel for-profit activities. The largest number of respondents considers it N/A at 68%. This may be due to several factors including that the respondent believes that as a non-profit they are not allowed to have parallel for-profit activities, or that they do not consider it appropriate or perhaps achievable. 14% were considering it and 5% were in the planning phase. 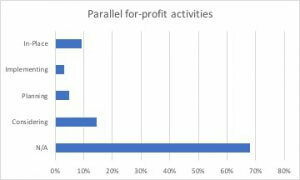 3% were in the midst of implementation and 9% consider parallel for-profit activates to be in place. Those who were in the considering, planning, and implementing phases were introduced to Paul Silva of Angel Catalyst and invited to join a cohort of their peers to work on developing their products. Those cohorts began in March of 2018 with five organizations participating. The final question addressed the Pay for Success funding model and Social Impact Bonds. This is a focus area for the Foundation as it potentially solves problems relating to the desire for impact investing by foundations, the need for stable, predictable and adequate operating support for nonprofits, and the political need for the ability to fund projects in arrears based upon attaining project objectives as measured by an independent third party. 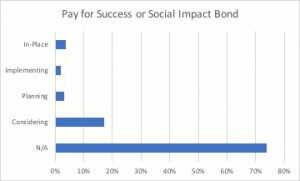 Social Impact Bonds (SIBS) are complex instruments requiring financial and organizational sophistication and strong data such as randomized control studies and longitudinal measures, both of which are helpful in determining causality. The majority of respondents indicated they thought the concept was not applicable to them. Of those that said they had such programs in place, two were from organizations that do not have SIBs in place but misunderstood the question. Many nonprofits may not be fully aware of the uses of an SIB and how it may assist their programs.Â The Foundation wants to foster productive discussions and work to increase the abilities of Pioneer Valley nonprofits to engage in social impact bond funding and to create an environment of stable and adequate funding using this model.Â The Foundation also believes that the pay for success funding model may help heal the political divide by listening to those who express disdain for current government funded programing structures and providing an acceptable alternative that also supports the goals of high quality social programs. Response to a supplemental survey question showed that 68% would be likely to join a cohort to work for an extended period to explore plan or implement one or more alternative funding models. 1) There will be a cost to attend of $110 for HSF members and $220 for non-HSF Members. 2) Any nonprofit is able to attend, even if they are not an HFS member. 3) There will be a general session, followed by breakouts, on site as part of the workshop. 4) The breakouts will be split into groups by organization size, and progress in education, planning, implementation, or completion of the specific alternative funding model. 5) The groups will be considered as possible members of a cohort, to work together, under the direction of the workshop presenters, to move from one stage to the next in the progression of education, planning, implementation, or completion of the specific alternative funding model. 6) Costs for cohort membership will be set by the third parties, but are generally in the $4,000 to $10,000 range depending upon the duration and intensity of the workshop. 7) Area funders may be willing to help underwrite the costs for organizations wishing to engage in a cohort and in some cases, some additional costs related to the efforts required to move forward with the initiative considering the impact on operations. Each funder should be engaged using their normal practices for grants and contributions. The high level of participation in responding to the survey is encouraging, and the survey comments were helpful in interpreting the results. The Foundation is indebted to Nancy Reiche of the Community Foundation of Western Massachusetts for her assistance in reviewing early drafts of the survey, as well as to Andrea Caswell and her advice on making it brief.Â Thanks also to Rebecca Coolong at the Human Service Forum for agreeing to partner on this important initiative. Finally, thanks must be given to the Board of Directors of the Foundation for their guidance, encouragement, support, and tireless work in support of Pioneer Valleyâ€™s nonprofit community and specifically in reviewing the drafts of the survey. Contact the Human Service Forum (HSF) at www.humanserviceforum.org/contact-us/if you wish to be invited to the June 6th presentation that will outline the workshop and cohorts program, or would like to be invited to the workshops to begin in September. Interest in specific presenters and content may be addressed to Ward Caswell or to HSF. Your comments are welcome. Be sure to contact the Human Service Forum to sign up for the Fall 2018 workshops.